This piece of Amish office furniture is a unique combination of a small secretary desk and solid wood bookcase to form an all-in-one work station that provides an organized and productive work environment. 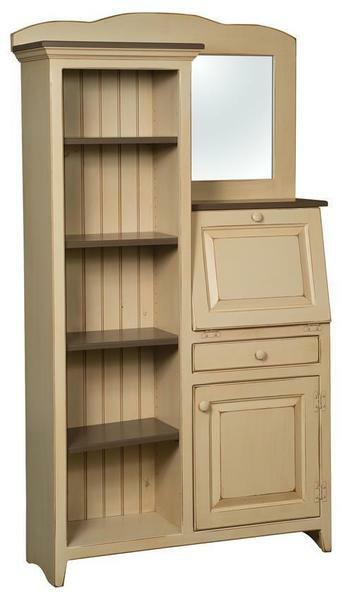 Shown with a beautiful buttermilk paint main color and ferret brown painted tops for a stunning two-tone finish. With four adjustable bookcase shelves and one adjustable shelf inside the bottom cabinet, you are sure to have plenty of storage for your office essentials. Give us a call today for additional information on this Side by Side Pine Secretary Desk and Bookcase at 866-272-6773.